India is a diverse country where people belonging to various cultural backgrounds reside. Therefore, all through the year, you will witness a variety of festivals and occasions. The month of April kick starts the regional New Year celebrations all across the country. Ugadi is one of those regional New Year festivals that people celebrate with high-spirit. Ugadi is the New Year’s Day for people of Andhra Pradesh, Karnataka, and Telangana. The first day of the Hindu lunisolar calendar month of Chaitra (March or April) is the day of Ugadi celebration. 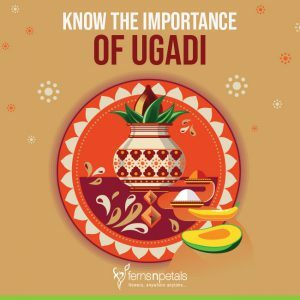 This year it is on 6th April and in case you know nothing about this festival, the, read below and know the importance of Ugadi. Ugadi or Yugadi is a term that is derived from the Sanskrit words yuga meaning age and ādi meaning the beginning. So, it means “the beginning of a new age”. Many people say that on the day of Ugadi or Yugadi, Lord Brahma started to create this earth. Do you know that Yugadi is one among the many names of Lord Sri Maha Vishnu? Yugadikrit is his other name that refers to the one who creates Yugas. Therefore, it is the perfect day to worship the Parambrahma who created “Time”. As per the historical records and astrological calculations, Ugadi is the day when Lord Sri Krishna’s Niryaana begun in the early hours of the fortnight of Chaitra and this day marked the beginning of Kalyug. Therefore, Ugadi festival is also linked with the start of Kaliyug. Apart from the factors mentioned above, Ugadi is also a celebration among people as a token of gratitude to nature for providing mankind with every necessary thing. People belonging to the Telugu, Kannada, Kodava and Tulu cultural background in Karnataka, Telangana, Andhra Pradesh, Tamil Nadu, and Kerala celebrate the festival with great pomp and show. The friends, extended family, and relatives gather and enjoy an eventful day with ugadi wishes and great food. So, Ugadi also celebrates love among people. The day generally starts with ritual showers with perfumed oil and prayers. This festival, Ugadi also welcomes the season of Spring. We see the symbols and colors of Spring in nature. Ugadi celebration forges with great enthusiasm and this boosts people to accept newness of life. During Ugadi, garlands of mango leaves & jasmine flowers are used. The decoration of the entrance of the house is done with these garlands. This is the season of jasmine and mango. And that’s why you see the use of jasmine and mango in Ugadi which is also a symbol of well-being. Moreover, jasmine heals the mind while the fragrance of fresh neem and mango heals airborne diseases. Out of all the special dishes like pulihora, bobbatlu, or New Year burelu, Ugadi Pacchadi is the most important one. This is a chutney that consists of all the five tastes or flavors – sour, bitter, sweet, salty, and tangy. The ingredients of this dish are neem flowers, tamarind paste, jaggery or brown sugar, salt, chili powder, and mango. Ugadi Pacchadi contains all the major tastes and thus it symbolizes the fact that life is a mixture of all these tastes. Salt represents “interests in life” while sweet or jaggery represents “happiness”. Tamarind or sour taste symbolizes “challenges” while neem flowers or bitter taste symbolizes “difficulties in life. Raw mango or tangy taste refers to “surprises or sudden challenges” while chili powder or spicy taste refers to “angry moments” in one’s life. This Ugadi chutney is important also for these facts: neem flowers prevent skin allergies and kill germs and bacteria; jaggery eliminates the chances of anemia; chili powder improves the immune system and renders a better eyesight; tamarind helps in a great digestion; salt helps in keeping the body hydrated; green mango improves blood circulation. The summer month of India is a painful one and this chutney provides the body a natural shield against all summer weaknesses.